So, I finished the W tank Sunday. Interesting story, I was knitting Sunday outside of Starbucks, and a woman who had sat down at the next table started asking me about my knitting. She was from Norway where knitting is common. I told her that knitting was popular here, but not so prevalent that I would say common, but certainly it has seen an upsurge in the last few years. Anyhoo - despite knowing better, I did not pick up two for every three stitches along the bottom for the garter stitch hem. 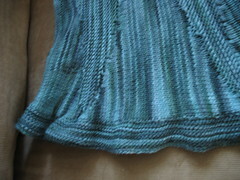 (I also discovered, I am not so good at doing garter stitch in the round.) So, I ended up with what I am calling a design feature of a flared bottom. While the medium fits great width wise, I found the straps were a bit shorter than I wanted - they would have fit, but the V would have been quite high. 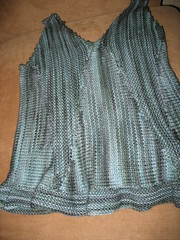 More than likely, this is because I used a smaller needle so that I could get a tighter fabric (no cami required). 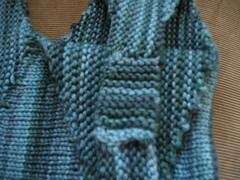 So, I added ten rows of garter to each strap.